In the final section of our Outdoor Insects Month Guide, you will receive detailed information and facts that pertain directly to hornets. These insects are types of wasps that are related to and highly resemble yellow jackets. In total, there are approximately 20 different species of hornets. Most reside in Asia; however, these outdoor pests are also located in North America, Europe, and Africa. Hornets are considered to be highly social insects that have the unique capability of constructing their hives by chewing wood. The wood then transforms into a type of papery pulp. Inside of the hive, the insects transition from an egg into a fully-matured adult. The queens are the dominant hornet of the hive and are the absolute only females to reproduce. Females abound in the hive as asexual workers that perform numerous tasks. There are very few male hornets. Those that do exist are in place for mating purposes. Once they have successfully mated, they die. Continue reading for more facts pertaining to hornets. The most common type of hornet observed in the United States is the European hornet. This is a type of species that originated from Europe, but, was introduced to the North American region by humans. This type of wasp is typically yellow and brown. The total size of the adult pest is approximately one and a half inches long. Many individuals refer to the baldfaced hornet as a standard hornet; however, it is not considered to be a true species. For the purpose and intent of this guide, though, we are including information about this pest because it has gained the reputation of a hornet among society. This creature is black and white and most commonly measures about an inch, in length. 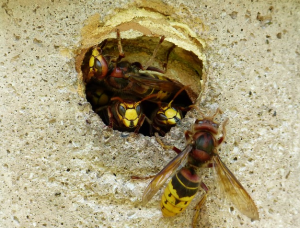 According to environmentalists, hornets are considered to be beneficial predators that assist in controlling many outdoor insects; however, these wasps are capable of inflicting an extremely painful sting. If the hornet senses any danger in or around their hive, they have the tendency to become exceptionally aggressive. The purpose and intent of this aggression is, ultimately, to act in defense of the colony to which they belong. The workers that are part of the colony have stingers that are considered to be highly potent. Unless they sense danger or feel threatened, they will not sting a human. The stings are very painful. There are many people who have an allergy to the venom that hornets eject upon stinging. For these individuals, the outdoor pests are extremely dangerous, as the reaction could be potentially life-threatening. The extermination of hornets is not only a potentially dangerous endeavor, it could be very difficult. There are many types of sprays and dusting powders that may be ejected into the nesting area that will terminate the outdoor pests; however, engaging in this activity could be potentially harmful. It is best to enlist the assistance of a professional pest control service to handle the hornet infestation that you have and the infestation of the other outdoor pests that you have been introduced to in our other 3 sections of the Outdoor Pests guide introduced this month. These professionals have aerosol sprays, liquid-based sprays, insecticide dusts and powders, as well as various types of power equipment that will quickly eliminate hornet wasps and other types of outdoor insects safely and effectively.